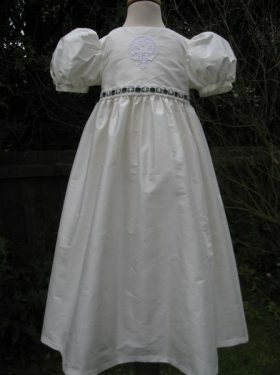 Christening Dresses are often a lovely choice for a little girl’s baptism. Perhaps you feel your baby is too old to wear a christening gown, perhaps she is toddling and then a gown may be too cumbersome for her. By chosing a christening dress, you will get a beautiful dress suitable for the baptism and also a practical dress to be worn for the rest of the day. A christening dress from the Scottish Collection is the perfect choice if you want that flexibility. The Savannah Christening Dress enables you to have a gown that contains your family heritage. A crest, shield or coat of arms is had embroidered on the bodice and your family tartan decorates the waistline. 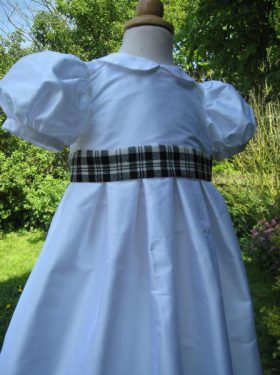 For a bolder tartan statement then chose the Scarlett Christening Dress with its fullsome tartan belt and large bow at the back. There is also a wonderful heritage of embroidery in Scotland, in particular in Ayrshire. In Victorian times groups of ladies would gather together and work in firelight and candlelight, producing the most exquisite embroidery. This embroidery would then be turned into the most delightful Ayrshire christening garments. Sometimes we are lucky to be able to acquire original dresses. Please contact us for details on what we have available. Or perhaps you have another idea for a little dress for your little one? Just contact us so we can discuss this further.